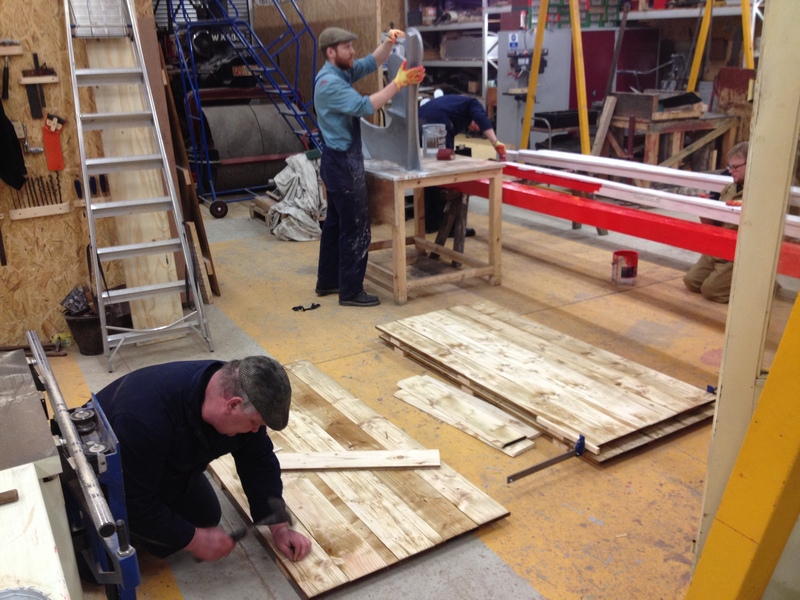 Another busy week behind us and with the weather warming up and projects on site beginning to reach fruition ahead of the new season (next weekend – aghhh!!) there is quite a bit to report on. 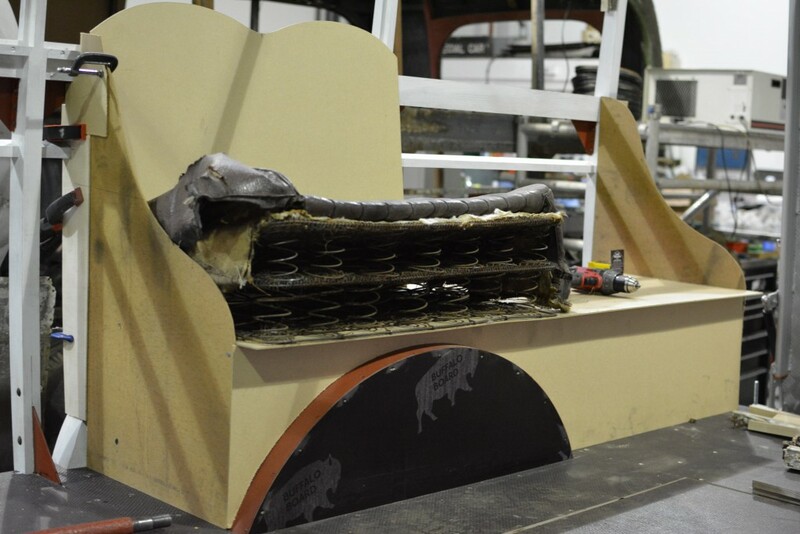 Below: The Erecting Shop is caught in full swing, with doors for the Council Depot being assembled (on the floor), the Gallopers sleighs being painted (centre) and the swing boat brake bar and other items being stripped and painted (to the right). Below: Down in the RMS the warming weather has meant work restarting on 58A. Phil is seen working on the running gear and also scraping the Mansell wheel centres. 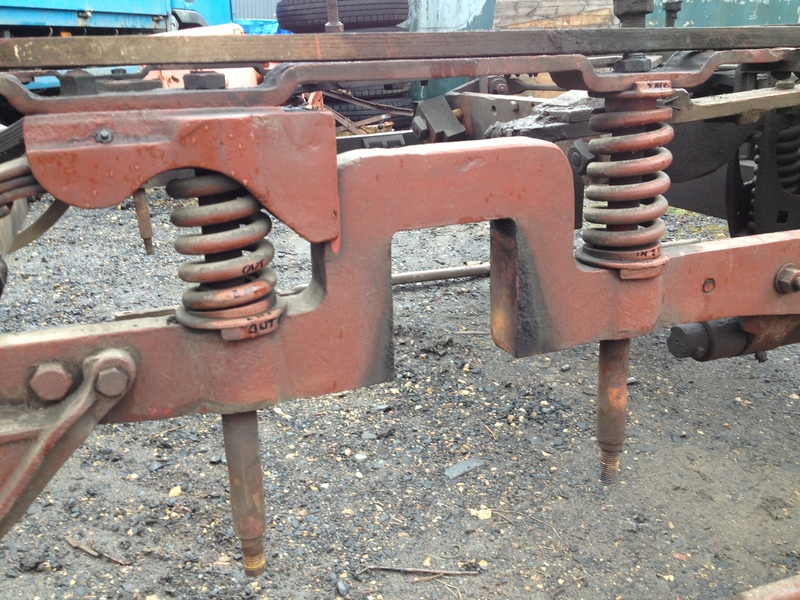 These wheels (which take the name of their originator, Richard Mansell, the one time Carriage & Wagon Superintendent on the South Eastern Railway) are a composite construction – perhaps the nearest brethren being heavy duty artillery wheels. 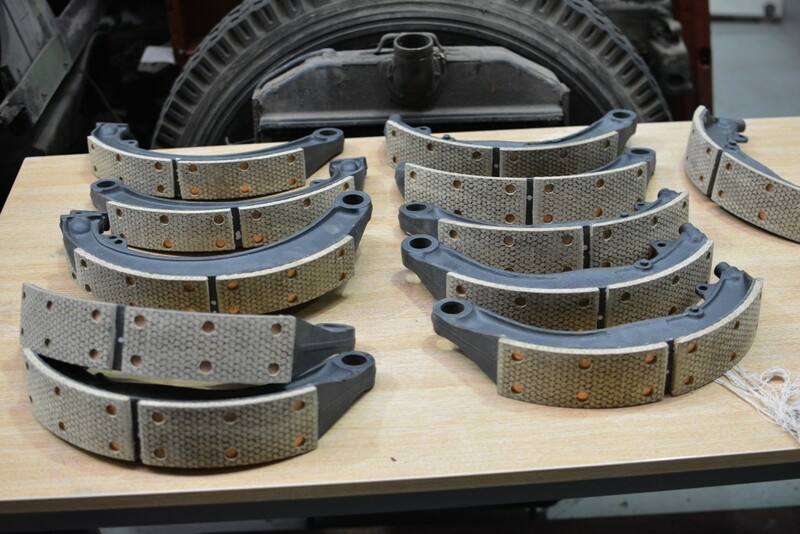 There are no spokes, but instead a wooden ‘fan’ of inserts which are fitted to a cast hub, through which the axle is inserted in the usual way, and a pair of clamped hoops at the outer extremetes. These are then tyred in much the usual way. 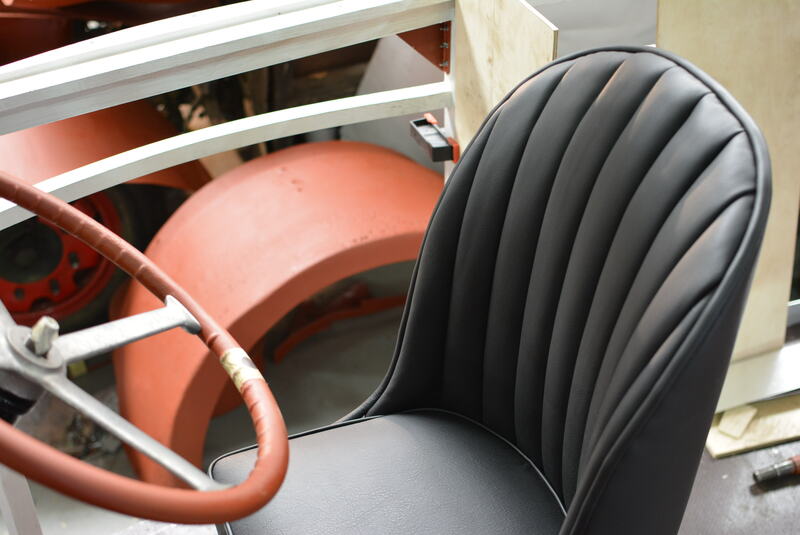 The aim was to create a quieter wheel (not dissimilar to the resilient designs in use today) and teak was the timber of choice. 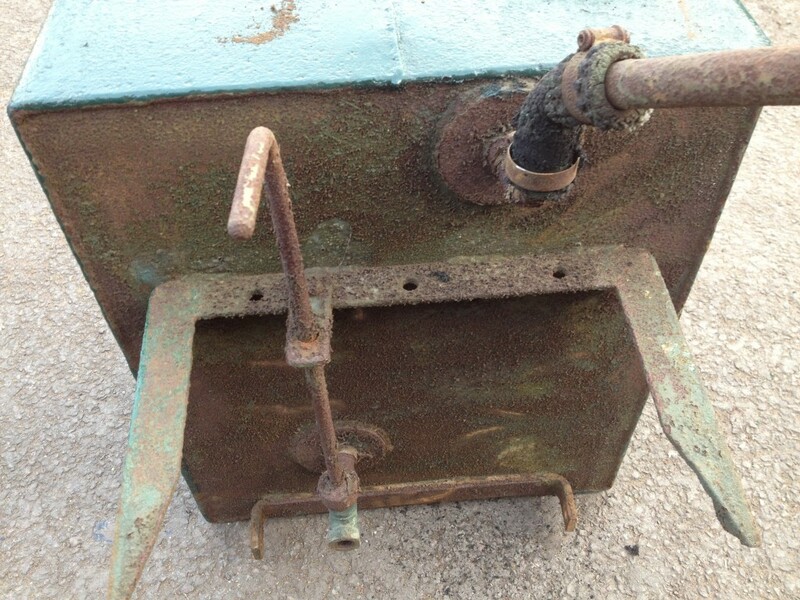 58A’s were so encrusted as to have lost the effect, and so a trial scrape was carried out and revealed the rather lovely wood colour beneath. Whilst I am no fan of white wall tyres (especially where not originally applied! ), the staining and varnishing of the Mansell centres can look very attractive and does reinforce that this coach is on its original chassis and not a converted PMV or similar, with the inevitable visual compromises that they bring to the Victorian (or thereabouts) appearance of older 4-wheel carriages. 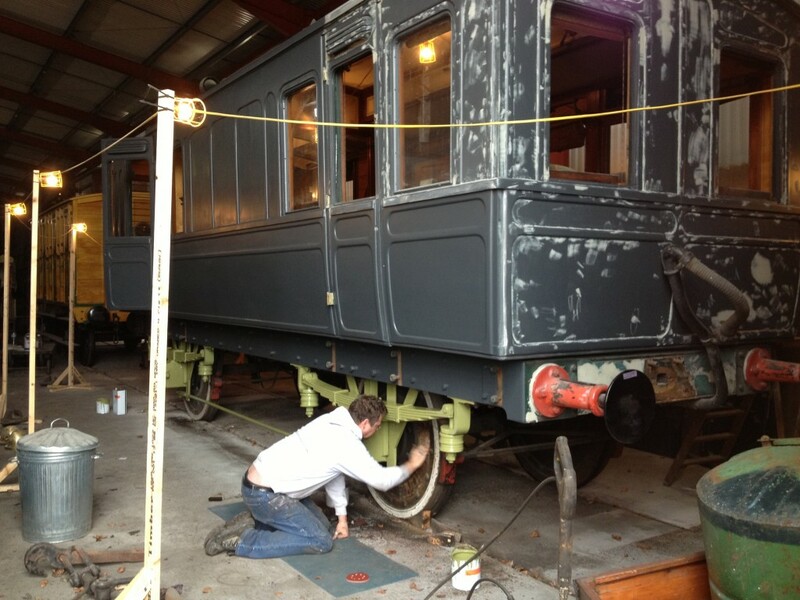 Also of note is the extensive re-filling on the bodywork, as Phil strives to achieve the highest quality finish as would have been applied to this coach and can be seen on its sister, 57A, at the Scottish Railway Museum. 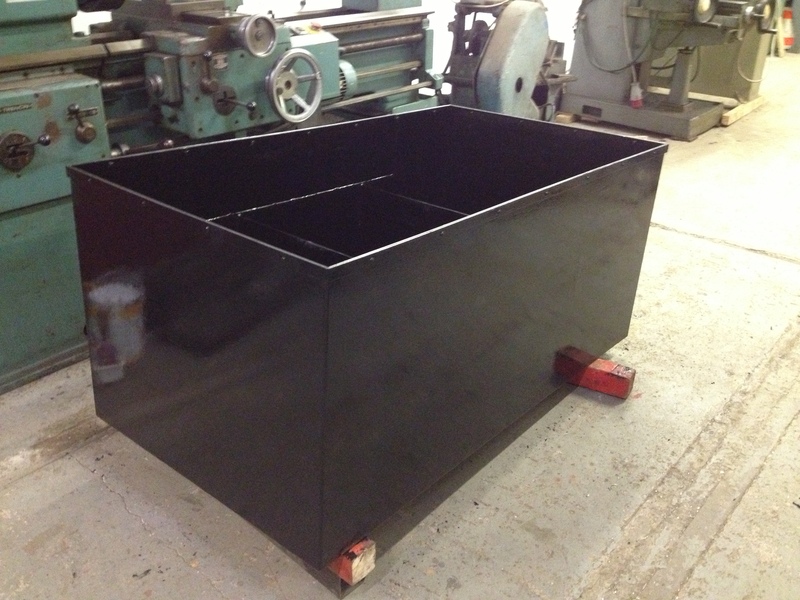 Below: The water tank for the narrow gauge system has been painted and will be fitted into its cast iron base/cradle this coming week. 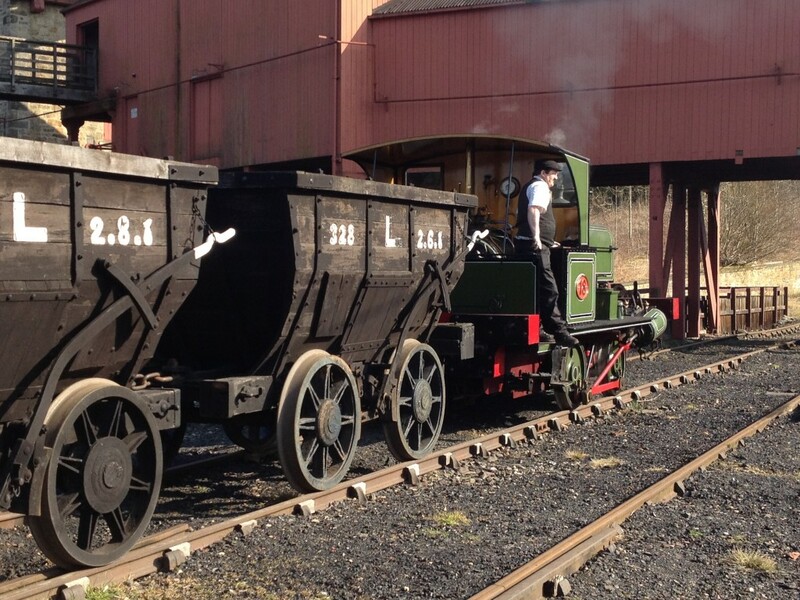 Below: Also on the narrow gauge front, Matt and I have been assembling the Joicey open waggon as and when time permits. 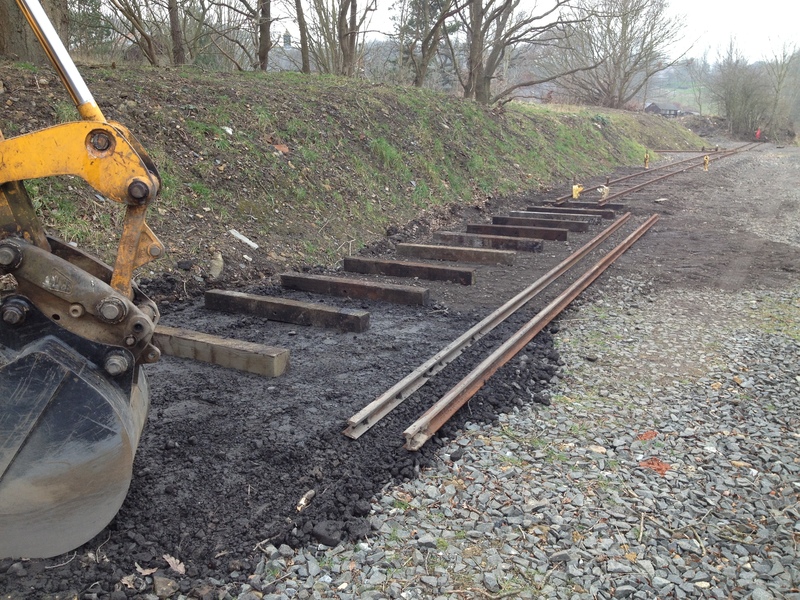 Below: Whilst the Track & Plant team have been laying narrow gauge track, at the rate of around one panel per day, ahead of the event in mid April. Below: With work on 264’s bodywork ongoing (including re-glazing and/or laminating of glass), the truck has been rapidly dismantled and steam cleaned (after these photo were taken!). 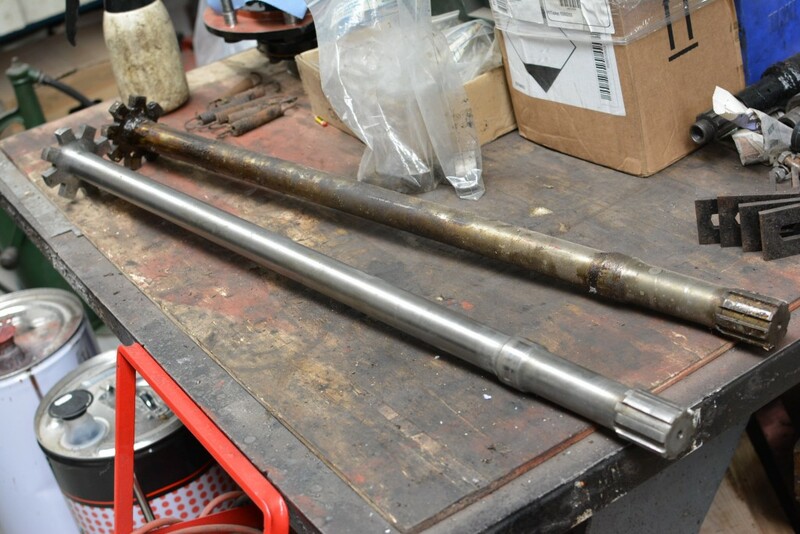 Whilst basically sound, we are going to tackle a number of issues of wear, including replacing all eight of the pendulum spindles (seen as the pairs of vertically attached rods below), to eradicate wear and as an option to welding (as our welder is not available at the moment). 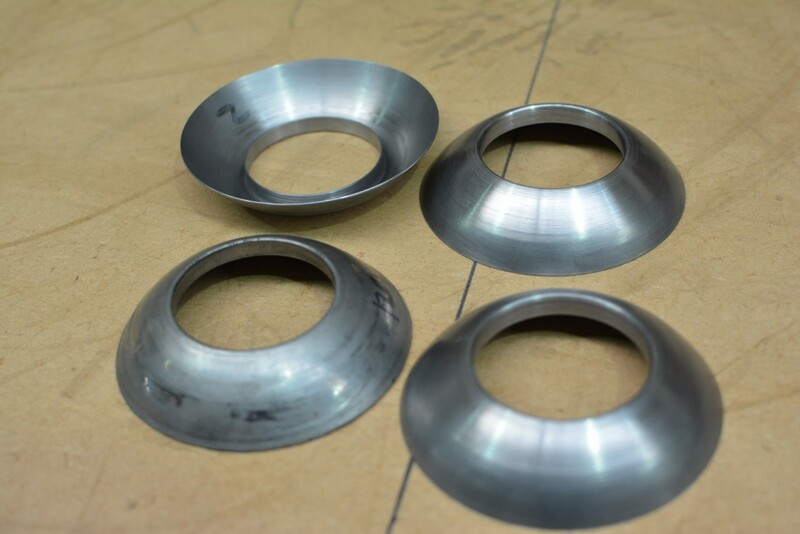 Below: The pendulums themselves appear to be sound at this stage, but the underkeeps, which are seen here as the circular cups with centre holes, are worn and will need boring and bushing. The primary springs that sit within these will also be replaced, as one was found to have a crack and it seems prudent to replace all eight with new components. 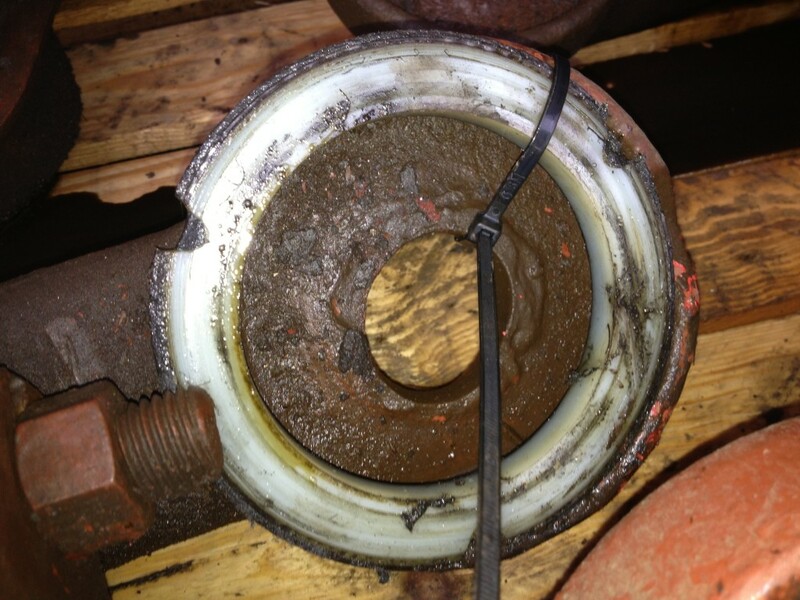 Below: A close up of one end of an underkeep showing the hole and how it has worn into a less than circular form! 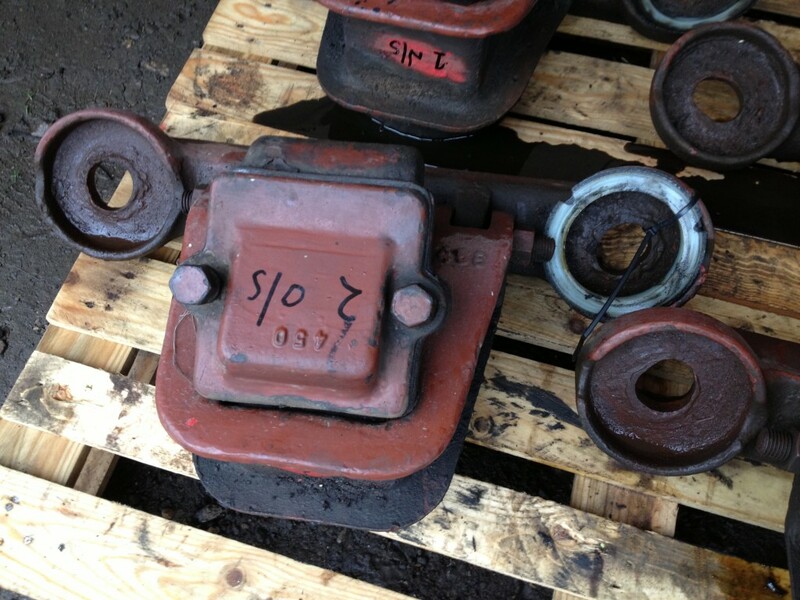 These take the forces of the wheelsets as they swing within the restraint of the pendulums and so can be considered prone to this type of wear. 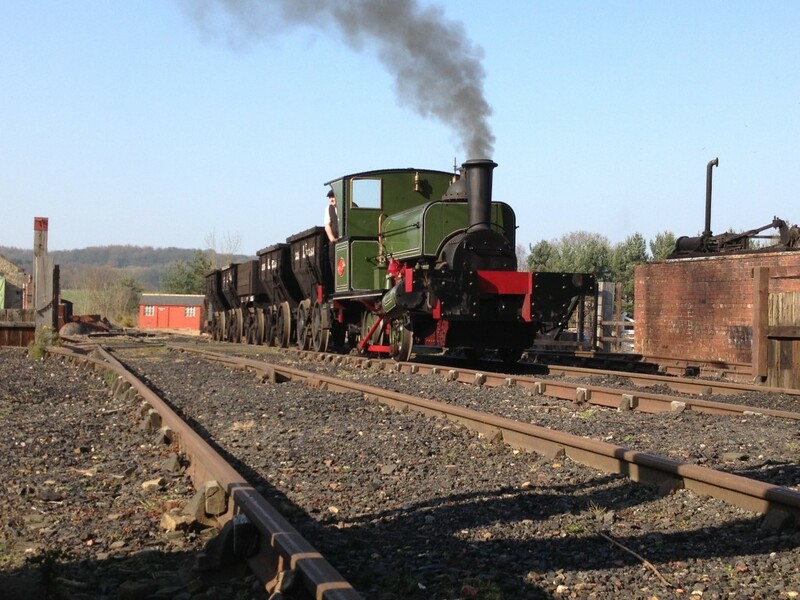 Below: Seb and his team continue to maintain the pace on 716 (the ex Crosville Leyland Cub). 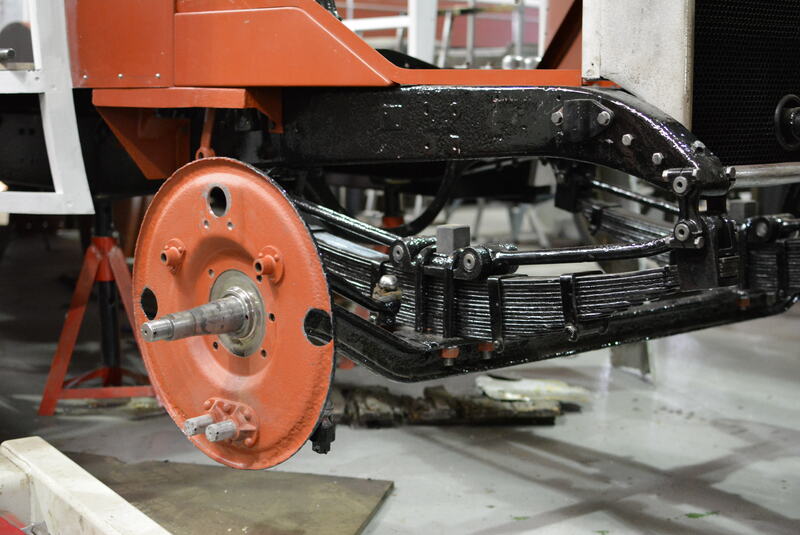 The front axle assembly is coming together now (still waiting on new drums), and the suspension is complete. 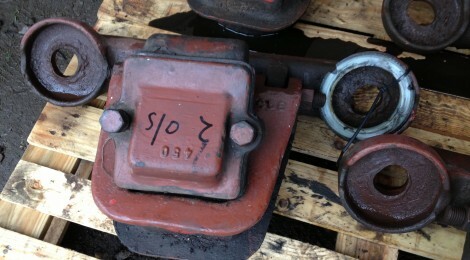 Below: The brake shoes have been re-lined (two for each front wheel, two for each of the four rear wheels). Below: Replacement prop-shaft after delivery… Original alongside. The team are taking great pains to eliminate wear from the drive train and other mechanical components. Below: I must ask Seb what these are! 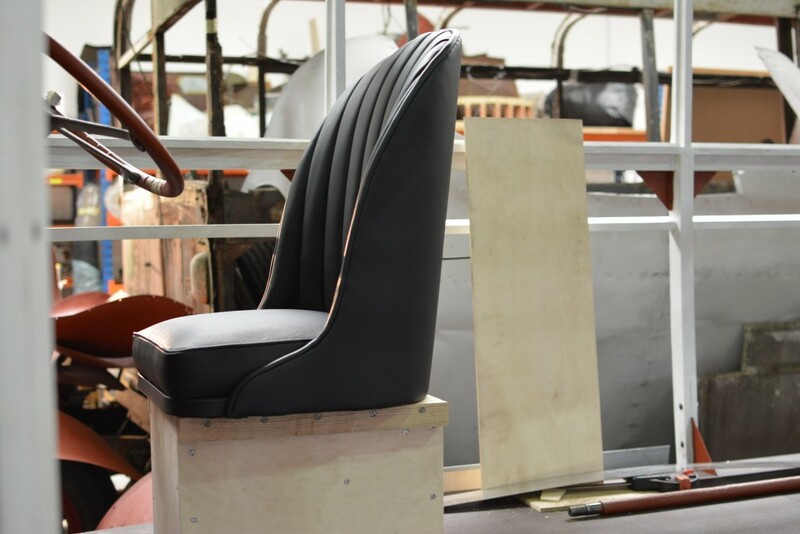 Below: A new member of the team has re-built and upholstered the driver’s seat, which is seen here atop its new box and placed inside the bus to give an idea of final position. Below: A mock up of the rear longitudinal seats is seen here – originally they were two pairs of two, mounted on the wheel arches and facing each other. 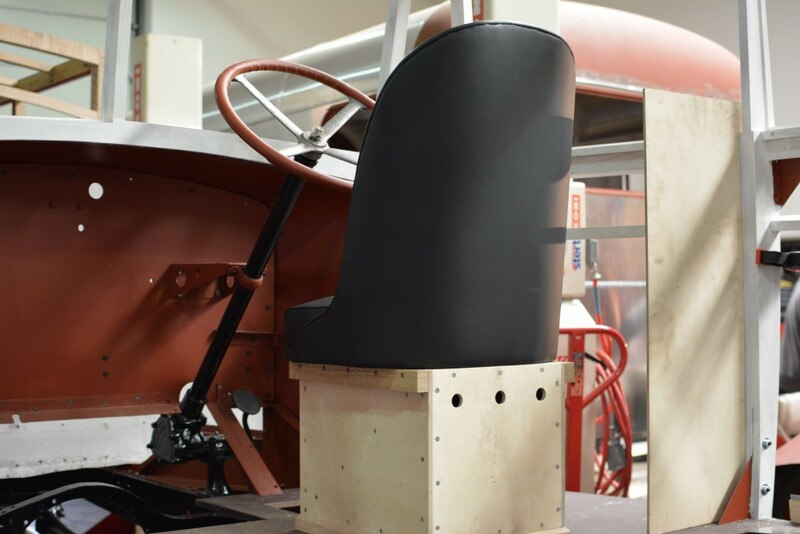 For our purposes, they will be two pairs of four, filling the gap to the rear of the bus in place of two traverse seats and preserving the maximum width for access via the rear doors. They will be made and finished per the original style however. Below: As the evening was warm, I removed the seat support, bulkhead, fuel tank and front water tank (used for watering the rolls when working on tarmac – this stoppd the rolls sticking to the tarmac and lifting it – rather like flour is used on a rolling pin when baking). Below: With various items stripped, the little roller is starting to look quite bare! Next job is to remove and dispose of the Morris Minor engine and gearbox, cut the frames back to original length and re-insert the rear cross-member. 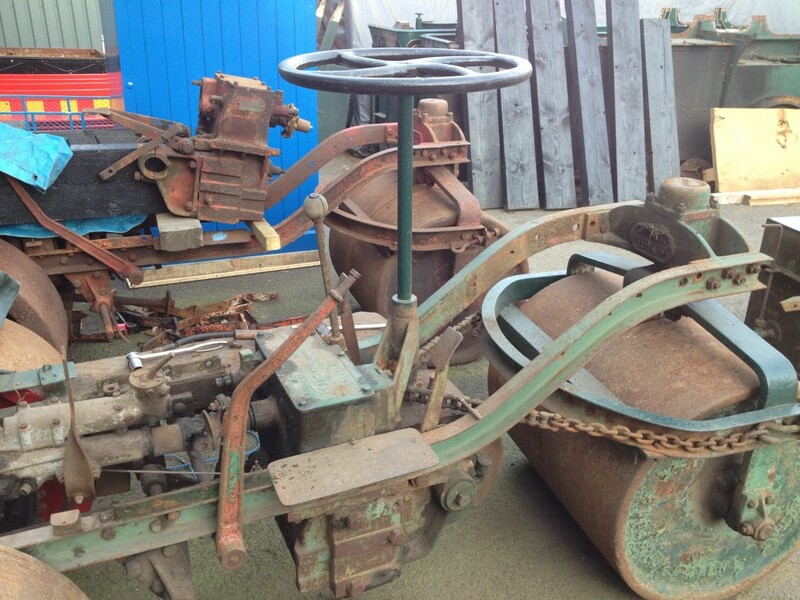 This has some damage so CC 002 (seen behind), the donor A Series roller, is likely to give up its identical component. 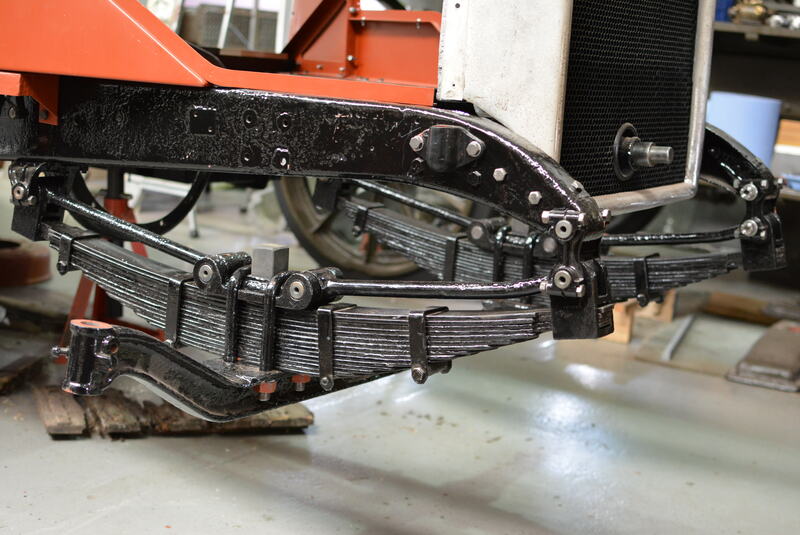 Then the gearbox can come out for refurbishment allowing the rear hornguides and axleboxes (very railwaylike!) and front roll suspension to be worked on and painted. 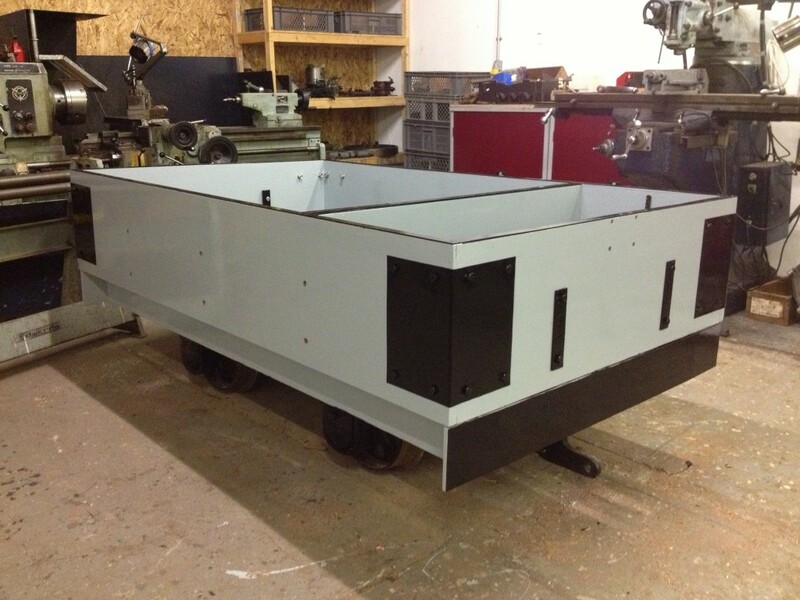 As it is fairly straight and tidy, this will give a good platform for rebuilding overhauled sub-components and refitting them in something like a logical order. So at present rate of progress this should be finished within 50 – 60 years!!! 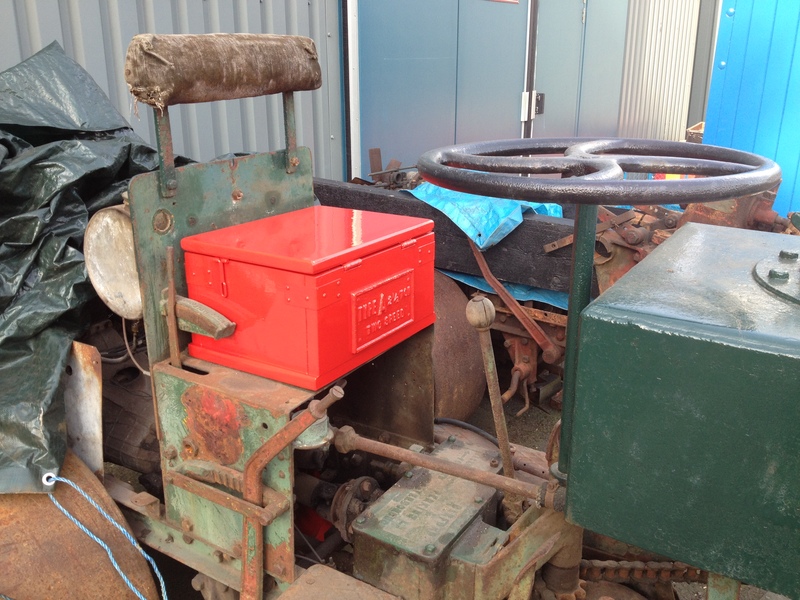 MK museum has a huge stack of the wooden parts of Mansell whI was offered some for firewood a year back!